Websites are becoming increasingly common throughout the world. 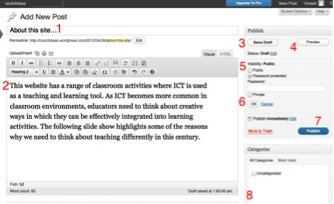 There are multiple uses for websites in education. The first is school websites (e.g. Kedron State High School, Caboolture East State School). Through this medium schools communicate online to parents, community members, Ministry of Education officers, and past students. School websites can focus on curriculum related issues, reports on school activities and more importantly highlight achievements of the students. The power of the Internet enables people from throughout the world to be informed about a school. School websites have different designs and layouts – this will depend on what messages the school wants to get across to the public In many instances, the cost and the technical knowledge of the staff can impact on the type of the website which is published and maintained. The second use is for student projects. There are a number of possibilities here. Acknowledging and recognising students’ work in this way can have a significant impact on them (e.g it helps build their confidence and their self-esteem). It also enables a school to showcase students’ work to the world. There are some examples of the internet which shows how this is being done in other schools – e.g. Sunnyside Elementary School, Landsdale Primary School, Chancellor State College. What is posted on a website should be carefully monitored. Policies need to be developed to ensure that only appropriate materials are uploaded. In schools, the head-teacher or his or her nominee can be given this task of uploading acceptable materials. Websites can be password protected – this will enable only those with a password to access a site. However, such protection restricts access. It is also important that websites are dynamic – apart from adding new materials, outdated information should also be deleted. Therefore, maintenance of a website is important. Developing a website can be quite expensive. However, websites can also be developed at no cost using tools such as WordPress. There are a number of other applications which can used to develop websites at no cost. However, this is one way to get started. The free version of WordPress provides a site name e.g. fijiproject.wordpress.com, theseeproject.wordpress.com. It also provides 3GB of storage space for files and photos. There are other options as well (e.g. domain name, 10GB of space, No advertisements). These options come at a cost and can be explored once confidence builds and the need for such a site is evident – based on user feedback. Explore the wordpress website (Click on this link or go to http://wordpress.com) Highlight some interesting aspects of the website. Now setup your account. 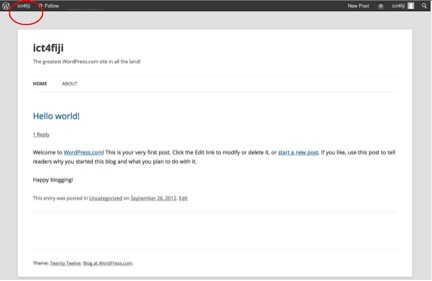 Click on the GET STARTED icon on the WordPress home page. Once you click on the GET STARTED icon, you will see the screen below. You will need a valid email address to setup your account. 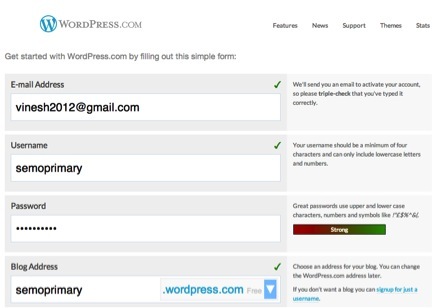 This is required to validate your blog account (an email will be sent to this email account once your blog is setup). You will need a username and password. You also have to create an appropriate blog address (generally the first word should reflect the type of website you are trying to create) . For the purpose of this activity – you do not need a domain name (you may prefer to opt for this later on). So choose “No, thanks, I’ll use the free address. 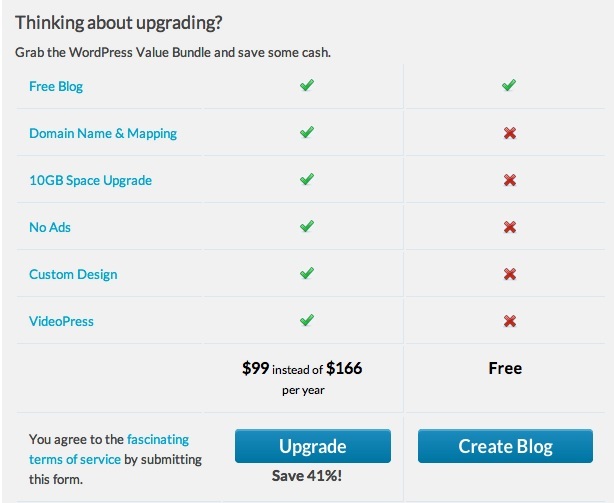 You also have the option to upgrade your blog site for a cost (paid once a year). This will give you some additional options – it can be explored later on. When setting it up initially, choose Create blog. Once you click on Activate Blog, you will see the following on the next page to confirm that your account is active. If you click on the WORDPRESS icon, the home page opens. Now you can Log in using your username (or email address) and the password. Open your blogsite. Type the url e.g. theseeproject.wordpress.com. Once your blog site is open, hover over your site name (e.g. ict4fiji) on the top left hand side of the page (as shown by the red circle). You will see a dropdown menu – choose Dashboard. The Dashboard page (shown below) lets you do all the work that is associated with the website. Notice the uniform resource locator (URL) or the address for your site. You may want to bookmark this. This will enable you to get to this page easily. On the middle of this page is a link to a video – click on it – it is a good video to watch. Anyone can upload his or her thoughts about a blog that is uploaded on your website. Sometimes the comments can be unfair, negative or unacceptable. Therefore, as the owner of the website, you should be able to moderate the comments and make a decision before it becomes available to the public. If it is a negative comment, you can delete it. 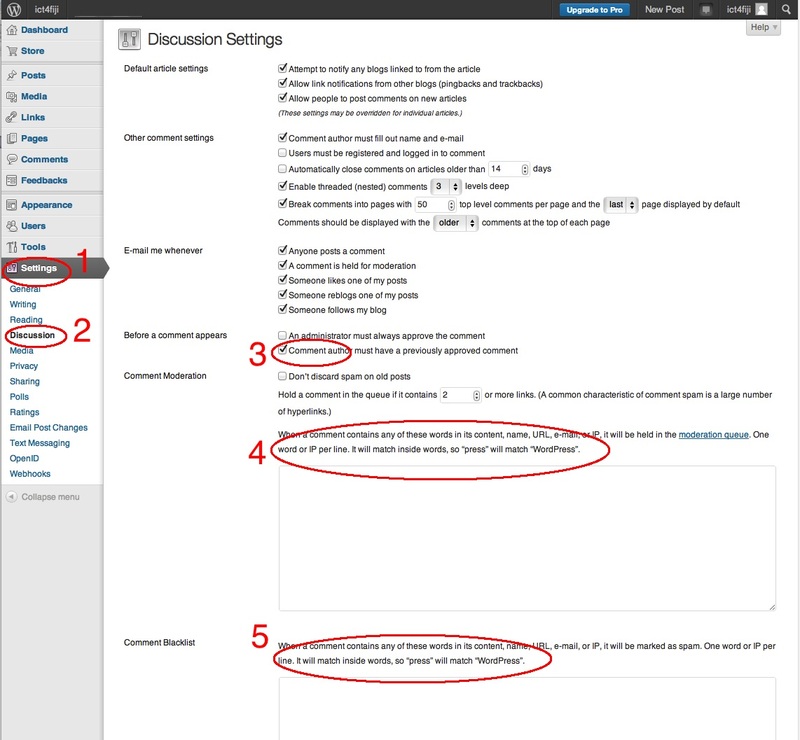 But for this to occur, you need to set the Discussion Settings on your site accordingly (see the screen shot below). To do this click on Settings(1) and then on Discussion(2). You will see two options for what to do with a Before a comment appears(3). So “Before a comment appears” you can either approve it first or the author must have a previously approved comment (someone who has been on your site before). The suggestion here is to pick the first option – “An administrator must always approve the comment.” (4) and (5) are also very important safeguards for the blog that appear on your site. The best way to approach this would be to list all words that may be unsuitable (e.g. swear words) in both boxes – 4 & 5. Now add a post. Adding a post is like adding a comment on your Facebook page. On the menu options on the left hand side (of the Dashboard page), click on Posts, then click Add new. Explore the icon on top of this page. some of the common options are (1) insert media (photos etc – needs to be in a jpeg format), vary text formats (2) (bold, italics), change text alignment(3), add and remove hyperlinks (4), changing format (5), and pasting a word document(6). Now it is time to write a blog. Start with a title for your blog (1). In the blank space (2) you can write your post/blog. An introduction to your site – what it is about is a good start. You can change and delete it afterwards. On the right hand side of the page (above) are some publishing options. You can save your post as a Draft(3) until your work is completed. What this means it that – your work will not appear on your site until you give it the go ahead. The Visibility(5) options are important i.e. who can view your blog once it is published. You can make it either Public (anyone can view it), Password protected (those with password can view it) or Private (only you can view it). The choice is entirely yours. It may be an idea to keep it private initially. Once you get used to writing your blogs, you can make it public. When you are ready – click (6). Once you have written your post, click Publish (7). You can also a add Category (8) to your post. For example, it may have sports and study as categories – it will depend on the content of your blog. Such categories enable you to keep track of what you are writing. Click on Preview(4) to view this blog. You should explore some other options that WordPress offers. Scroll over the menu options on the left hand side of the Dashboard page. Explore these options. Managed themes is a good option to know about. You can change the theme/layout/appearance of your website with one click. As long as you choose one that is free – it is not going to cost you anything. From the Dashboard page, click on Appearance – you will see the available options. To choose a particular theme, click on Activate(1). Some of the Premium formats(2) will requirement a payment. So to build your site at no cost, do not choose these. It may also be an idea to view the Details(3) of a format before you make a final decision. Once you have decided on a theme, you can refine it further. You can Customise it – this allows you to do things like change header image, colours, background image and so on. You can also do a Custom Design. Through this option you can change colours and fonts in the text. The Widgets option allows you to add and remove options such as Search Archives, Categories etc from you page. A widget is a small application which can be installed on a webpage to make it more user friendly. There are a number of other options which you should explore from the Dashboard Page. Applications such as WordPress are always evolving – users also write about their experiences and sometime propose new ideas for doing certain things (e.g. http://en.forums.wordpress.com/forum/ideas). 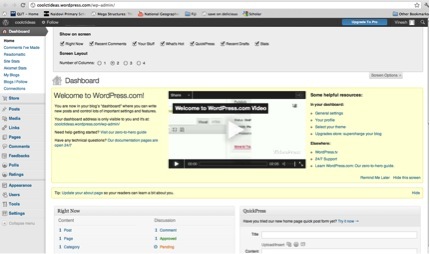 Another good way to understand the opportunities that WordPress offers is through videos on Youtube.